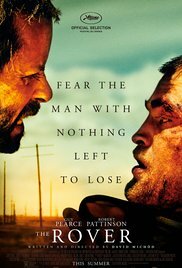 Ten years after a global economic collapse, a cold-blooded drifter traverses the scorched Australian outback on a mission to track down the men who stole his last remaining possession – his car. When he crosses paths with a badly wounded member of the gang, he takes the vulnerable, naïve young man along as his unwitting accomplice. Now this was a really bizarre movie. The only thing that sticks in my mind is that it’s a terribly slow film with a brilliant soundtrack. After watching “Chef” I was starving. After watching “The Rover” I was very thirsty. It’s obvious that this film, which is set in Australia in a post-apocalyptic period, will automatically be compared with “Mad Max“. And despite that there are many elements of excellent quality, it’s just a dead simple storyline which is blown up out of proportion in a bombastic and rather pretentious way so the artistic moviegoers will give it a standing ovation. The whole movie can be summarized as follows: a trio of criminals are on the run for something they have done. They steal a car they purely accidentally come across , while rolling over across the screen with their getaway car , somewhere in the-middle-of-nowhere. The owner of this car is not pleased with that and sets off in pursuit because there’s something precious for him in that car. And along the way he picks up one of the abandoned brother. That’s it! The rest you can complete as you please using your own imagination because you don’t get much information about where, why and how this whole situation developed in this art-house film. The opening scene with the three gangsters in the car drifting along the road and arguing the whole time, has a very high “Pulp Fiction” feeling. The part in which you see Eric (Guy Pearce) awakening / getting sober / coming to his senses (use your imagination) and afterwards stumbling into a sort of boiling hot metal silo that looks like a karaoke bar because of the extremely loud oriental music, can be compared with a scene out of a spaghetti western with a gunslinger who stumbles into a town in the middle of a godforsaken desert under the red-hot Nevada sun. These two interwoven sequences with the brilliant sequence of images of an in slow motion crashing getaway car, is perfection itself. It looked so promising. But the expectations were not fulfilled. Ultimately it’s just a typical road movie in dusty arid Australia. How did things get to this stage and what caused this community to become a totally wild, lawless and dog eating Australian civilization ? That’s something you can only guess. You only get the puzzling message “Ten Years after the collapse” at the beginning. What collapse do they mean? Is it about an economic collapse after which the Australian dollars became totally worthless. That could be the reason why everybody is always asking for American dollars. You could also assume that the immune system has collapsed. Because to be honest it’s a bunch of freaks you are confronted with. At times I had the impression that Eric and Rey were a kind of mutated zombies, because they were highly resistant to the impact of bullets from automatic rifles. The entire film is drenched in the hopelessness of the survivors and the stark hostility that prevails there. The situation is similar to the dusty Wild West. Also taking the law into their own hands. This makes for some gruesome scenes of gratuitous violence and explicit aggressive shocking images. Michôd is not really interested in telling a linear, clear story in “The Rover” but rather likes to exhibit an artistic set of images in this film. The purpose of the pursuit by Eric remains unclear until the end. Eric himself is not exactly an open book and keeps his motives hidden, using his gruff and closed nature. By the way, this is a magnificent performance by Guy Pearce, who I can still remember as Mike from “Neighbours” long time ago when this soap ran on television. I’ve never noticed him in another movie. But I’m sure there are a lot of films he played in I never saw till now. I didn’t recognize him with that scraggly beard and his tired, almost suicidal attitude. Robert Pattinson also excels as the slightly deranged Rey who always started telling some unintelligible and unimportant story on the most inconvenient moments. In short, grandiose renditions. What intrigued me in this film was the soundtrack. An eerie and mysterious sound used as an underlay. A cacophony of all sorts of exotic sounds, including a didgeridoo I think. A wonderful addition to the sometimes hallucinatory images which made it even more chilling. A fairly quirky film with images used as art. Sensitive and brilliant performances. And an excellent soundtrack. But ultimately there remains a fairly superficial and boring storyline. For me it was a bit too “arty” and too difficult to fathom. I read somewhere, “A person who sits brainless in front of the screen, just sees a man on a devastating journey throughout a desert landscape”. I certainly wasn’t watching it brainless, but eventually that’s also the only thing I saw ….